« So, you want to ride? 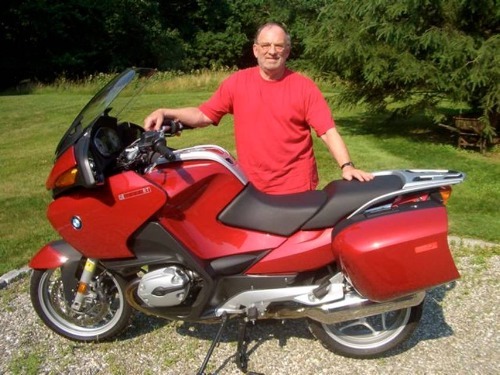 Good friend and fellow-rider Arthur Einstein (see his comment on “Buy the Right Bike” post below) emailed to let me know he’d let his beloved Triumph go and had purchased the BMW 1200RT. Here is picture of the happy couple. 1. Shopping. Nobody wants to sell you a bike. Nobody took my name or contact info. Nobody tried to help me make a decision. Nobody convinced me they knew the product. MO and MCN reviews online were the best help I got. 2. Dealer I bought this from (used with 747 miles – a 2005) didn’t clean the bike. Riding I found it missing badly. Made it back to the dealership before it closed. A tech determined it had a bad plug. The kicker of course is that nobody checked out the bike before it was delivered. 3. In the process I bid on a bike at eBay and eventually sold the Triumph there. In both cases scammers tried to bait me with second chance offers. I also learned that other bidders on my bike got bogus emails re second chance offers too. 4. I wrote a pretty thorough description and on reflection think that helped a great deal. It established me as a serious seller and knowledgable rider, gave a good rationale for selling the bike, and generally gave bidders some comfort. It got lots more bids than a similar bike that was up at the same time. I will miss the Triumph. It’s lighter and handier than the BMW. It’s sort of like the difference between a Miata and a Lexus 430. One’s light and handy. The other’s a Luxo cruiser. The real point is that I’m having to learn to ride differently. At a stoplight on an incline I can hold the Triumph with my legs, two feet on the ground. In the same situation, the BMW makes me keep my left foot on the ground and my right on the brake. I just have to learn to do things differently. Fabulous suggestion BRob. Any idea where I can get the Crushed Velvet riding suit and proper accessories to go with these beauties?